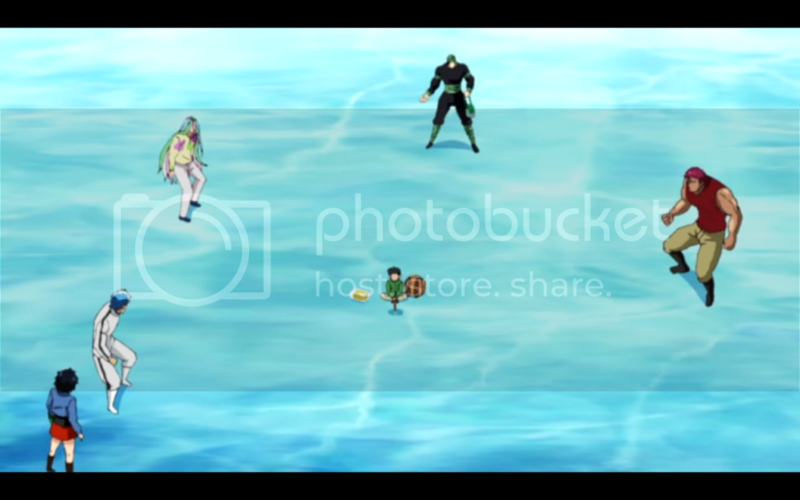 The four kings gather together, and between them and Komatsu they compete to see who can catch the Madam Fish first. 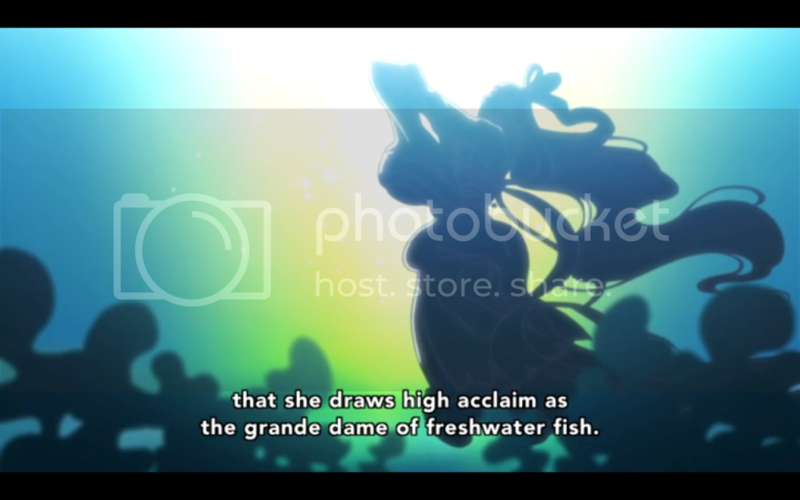 While the four kings use their special abilities to narrow down the Madam Fish’s location, they all discover that Komatsu picked the right spot at the beginning, thanks to his food luck. Together they are able to catch the fish and defend it against an opportunistic predator. Well then, this is a bit of an awkward title considering what episode number I have it on. 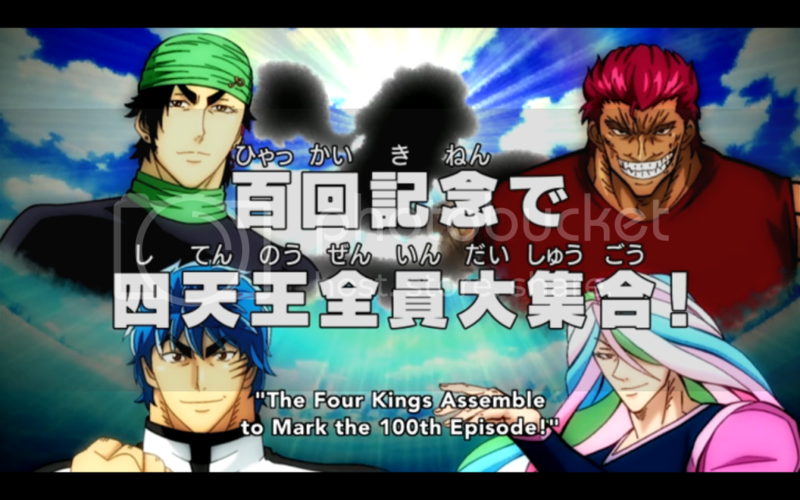 It’s not that I have it wrong, I’m counting the episode numbers based on what Hulu has, it’s that the creators of the Toriko anime are in fact cheating with their numbering. Episode one was in fact a crossover with the popular One Piece; episode fifty one was yet another crossover with One Piece; and episode ninety nine was a crossover with One Piece AND Dragon Ball Z. So going by non-crossover episodes, or the only episodes we can get legally in the states, THIS is episode ninety seven. Interesting side note, the very “first” episode of Toriko, ie/ the crossover one, has a different name in the One Piece episode list. Though, since they insist on being a bunch of cheater faces, this is technically episode one hundred. And what do we get to celebrate such a momentous occasion? 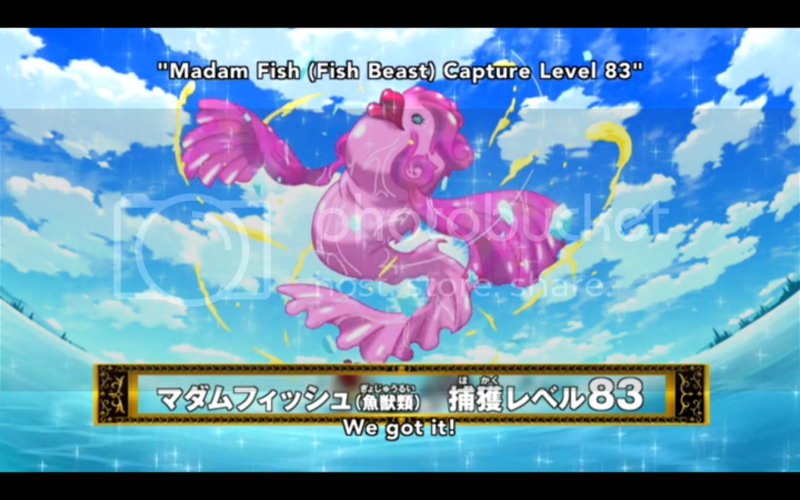 Well, for one, we get a canon episode so that’s nice, but out of all the major moments of the series I wouldn’t have thought that the Madam Fish chapter was worth commemorating as the hundredth episode. But I guess there’s not much they could have done about that, besides not count the crossover episodes in the official episode ranking; and cutting out the filler episodes; and adjust the pacing to not only flow better but allow them to decide on a different episode for this hundredth episode. Actually, there was a lot they could have done. This was a fine episode, nothing groundbreaking, and definitely not what I would have aired for a landmark occasion like this, but I guess that’s just how things turned out. 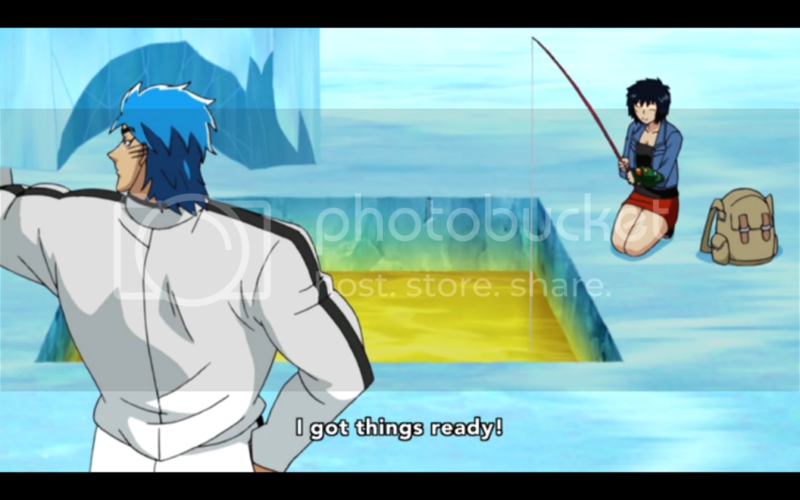 Toriko can pull off some surprisingly conflict free episodes every once in a while. With the exception of the scavenger at the end that is. 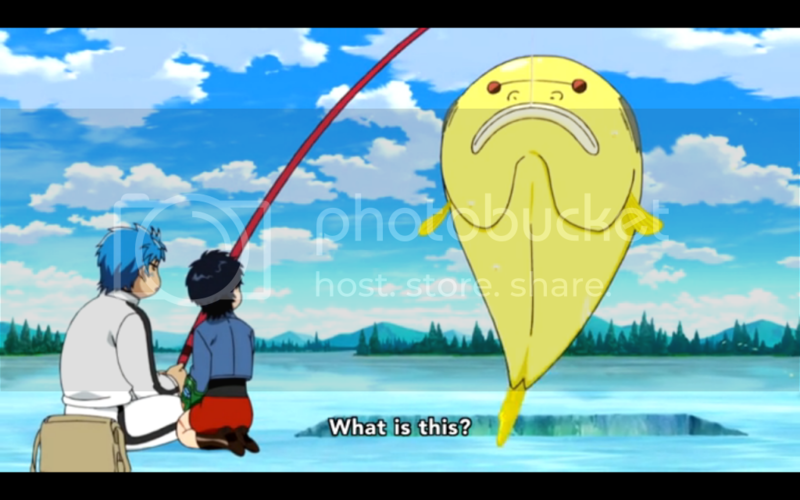 Still, it’s a mark of the characters’ strength that even after going through the Toei prism they can support an episode about all of them going fishing. The appeal of this episode comes from the fact that it more or less stands on its own, and can be watched without having to worry about previous episodes. It’s a nice breath of fresh air before the next big arc. Though, knowing the manga as I do, I’m aware that the next few episodes will be standalone stories taken from the manga. With maybe a bit of filler here and there. It would certainly be the best time to insert filler, rather than trying to force it into the middle of a big arc. This episode will be unsatisfying for anyone that wants the kind of big stories we’ve had in the past. But it’s a good chance for regular viewers of the show to sit back and enjoy a simple story without all the baggage of the larger story arcs. It’s good, but not mind blowing.